I am getting ready for a photography workshop with John Barclay and Mitch Dobrowner at Capitol Reef in southern Utah. Part of the preparation is to select images of past work to show to the workshop group. I’ve spent the last two days reviewing my images over the past year. My focus for this workshop will be black and white photography. Overall, I am disappointed in my progress in 2018. I could not identify many individual stellar single images that stand completely by themselves. However, I did notice that I have several good images when taken together tell a story of the feeling I had experiencing a particular site. A collection of my images is stronger than any single image. For the next few days I will post a series of images from the Alabama Hills last April. The Alabama Hills is a series of rounded rock hills and rock formations on the eastern slope of the Sierra Nevada Mountain Range near Lone Pine, California. Mt. Whitney towers above the range. Since the 1920’s the rugged area has been used as a location for over 150 movies and TV show’s. 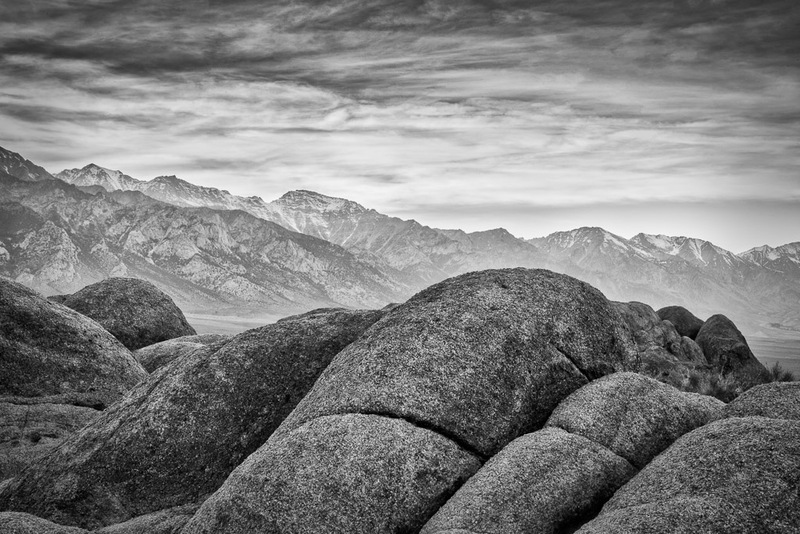 This image was taken looking northwest over some large boulders of the Alabama Hills toward the eastern Sierras. This entry was posted in B&W Photography, The Grand Landscape and tagged Alabama Hills, Mountains, rocks, Sierra Nevadas on March 6, 2019 by kgrafphoto.